Inspired by its infamous founder, Highland Park has added a new whisky to its acclaimed range of core expressions. Dark Origins launched in the U.S. on Oct. 1, 2014 and will roll out internationally throughout the fall. This new permanent expression is a non-chill filtered single malt that’s bottled at an ABV of 46.8%. 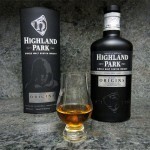 Highland Park touts the use of twice as many first fill sherry casks in Dark Origins as the Highland Park 12-year, for a “naturally darker, richer flavour.” As with the whiskies of the Highland Park Warrior Series – six single malts named for legendary Nordic figures, available exclusively in the travel retail sector – Dark Origins carries no age statement. Establishing a secret bunker in the hills of High Park in Orkney, Magnus “Mansie” Eunson became a famed dark distiller back in the late 1700s, creating whisky for the people of Orkney to offer relief from the villainy of the tax collector. By day he worked tirelessly in his church providing spiritual guidance to the people of Orkney, but in the dead of night, he hand-crafted what was to ultimately become the best spirit in the world, warming hearts and uniting all who tasted it. The Dark Origins bottle is the first Highland Park core expression with this black-and-silver design, which echoes the Orcadian Vintage Series and is starker than the Ragnvald and Thorfinn black bottles from the Warrior Series. Last month, a group of writers was invited to sample Dark Origins at The Varnish in Downtown L.A. The event was hosted by Highland Park’s Brand Ambassador USA and Asia Pacific, Martin Daraz and Highland Park Brand Manager, Stephanie Ridgway. Guests were virtually transported to the Highland Park distillery in Kirkwall with an interactive presentation that included sherry cask shavings and Orcadian peat, which was lighted and then filled the Downtown speakeasy with a marvelous aroma. In his remarks, Daraz wryly noted that Highland Park has been “officially” making whisky since 1798, but gave a nod to the company’s “dark origins” by acknowledging Eunson’s illicit activities. Daraz also compared Orkney to Texas – just as the Lone Star State has its own culture and is still part of America, Orcadians are Scottish and yet unique. Norwegian settlers arrived in the Orkney Islands in the late 8th and early 9th centuries – the Viking influence can still be seen in landmarks and the majority of Orcadian place names. In addition to the Warrior Series, Highland Park pays tribute to this heritage with the Valhalla Collection, an ongoing series of limited annual releases named for the Norse gods Thor, Loki and the goddess Freya. As with all Highland Park whiskies, no caramel coloring is used in Dark Origins. The first fill sherry casks that give Dark Origins its dark amber color make themselves known immediately on the nose, along with milk and dark chocolates, dried fruit and a whisper of smoke. On the palate, there’s a surprising bit of heat that accompanies cherry, chocolate, Christmas spices and floral peat. The long finish is sweet and dry, offering chocolate, orange peel and gentle smoke. A few drops of water opens up Dark Origins to even more fruit and spice while rounding off the velvety mouthfeel. Simply put, it’s a superb whisky that will appeal to longtime Highland Park fans and newcomers alike. 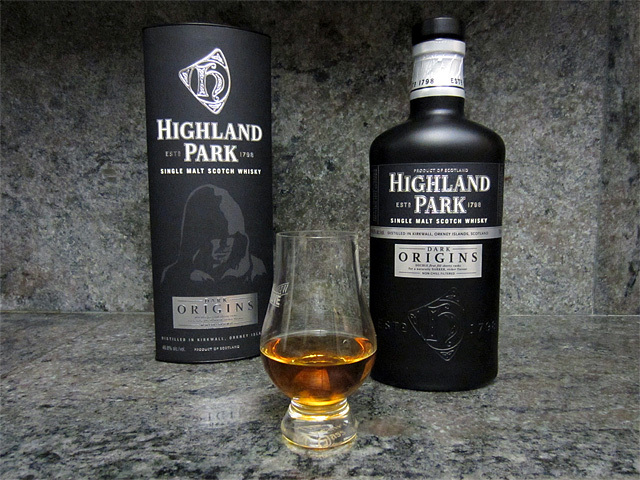 Priced at $79.99, Dark Origins is a worthy permanent addition to the Highland Park range of core expressions. With its striking blackout design, Dark Origins will be a perfect gift bottle for that Caped Crusader, goth or L.A. Kings whisky fan in your life. For more information, visit highlandpark.co.uk.